I love making my own fun Spring Scarves. This past year I purchased a TON of Knit Jersey fabric to make a few Maxi Skirts and Dresses. When I made all that I wanted, I had several yards of fabric leftover. What to do? Well, seeing that I love scarves as much as I do, it was a bit of a “no-brainer” for me. Here is a fun, quick, and easy DIY Spring Scarf Tutorial that is very beginner. That’s so awesome! And it made me happy to go back and look at your maxi skirts/dresses post. You are definitely the best dressed person in the world. Did you run the ruffle stitch down the middle or on the edge of the strips? Luv them! I ran the ruffle stitch right down the middle. I love this – so easy and cute. I have lots of leftover jersey fabric since I sew a lot with knits. Thanks for sharing this – pinning. Totally adorable! I could see getting 10 of these out in a couple hours lol I am a slow sewer! Love this scarf; but what do you do if your machine doesn’t have a ruffler? Check out the post, I didn’t use a ruffler….I am not that talented 🙂 I just increased the length and tension. The numbers are in the post! 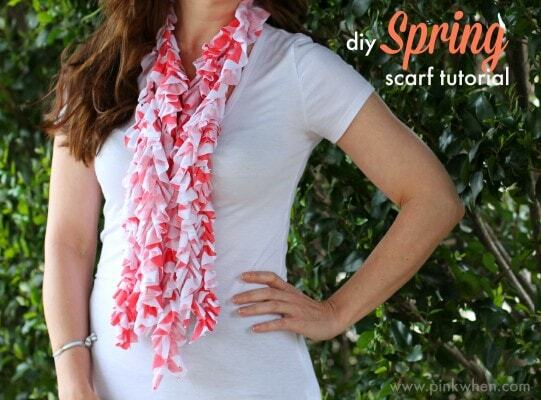 Thanks for sharing this cute spring scarf tutorial at The Pin Junkie. It’s being featuring at this week’s party. Hope you’ll stop by to party again with us this week! I don’t have a “ruffler” – it would be great to have a close up photo of how you sewed the lengths – that’s the difficult bit! You have a pic of the cut strips – that’s the easy bit!!! !